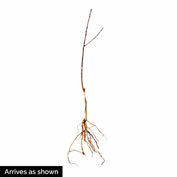 Mericrest Nectarine Tree | Gurney's Seed & Nursery Co. Produces plenty of attractive, dark red, smooth-skinned fruits with firm yellow fresh and a mild, slightly tangy flavor. This freestone variety is excellent for eating fresh and cans well too. Ripens in mid to late August. 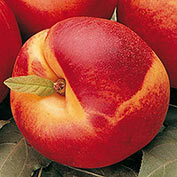 One of the hardiest nectarine varieties available, Mericrest can take temperature to -14 degrees F. without loss of crop. 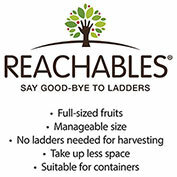 Resistant to brown rot and leaf spot. Requires 800 chill hours. 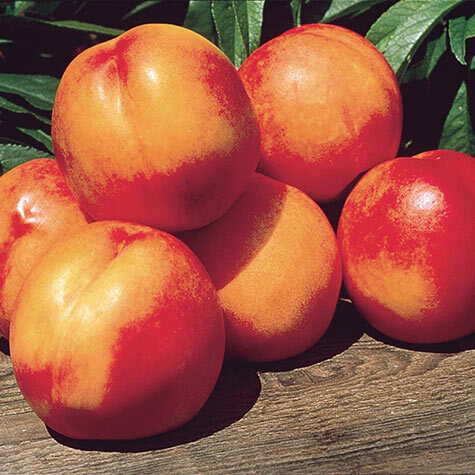 Self-pollinating, but produces even larger yields with another peach or nectarine variety. Zones 5-8. Comments: The hardiest nectarine. 800 chill hours. Can take temperatures to -14 degrees F. without loss of crop.-20 degrees F. Smooth dark red skin. Firm yellow freestone flesh. Excellent quality. Resistant to brown rot and leaf spot.